glaciers, both in the northern and southern hemispheres, started melting in the mid-eighteenth century, triggered by climate change. Researchers from the Wadia Institute of Himalayan Geology in Dehradun tracked the age of lichens (a composite organisms formed by the association of fungi and algae) that develop on glacial moraines and came up with this find. It contradicts previous conclusions which say that glaciers have been retreating for the last 20,000 years. R K Chaujar, the lead author of the study, traced the advance and recession of the Chorabari glacier in Uttarakhand with the help of the lichen Rhizocarpon geographicum. He found that the glacier started retreating 258 years from now. "Before the 258 year period, the glacier was mostly advancing," he said. Chaujar studied the yellow coloured lichen that develops on the surface of the exposed boulders after the glaciers recede. As it ages, it's diameter increases at a constant rate. There is also a lag period between the recession of the glaciers and the growth of the first lichen. This lag period, also called colonization delay, is constant for a particular region. Parameters like the soil structure, the mean annual rainfall and temperature have negligible effect on lag time and on the lichen's growth rate. If the growth rate and the lag period of the lichen at a particular place is known then the date of recession of the glacier from that site can be found by measuring the diameter of the largest lichen, said the study published in Current Science on March 10. "The diameter of the oldest lichen helps calculate its age and this gives the date of the glacier's recession," said Chaujar. This study disproves a previous research published in the Journal of the Geological Society of India in 2006, by V K Raina, former deputy director general of the Geological Survey of India. It claimed Himalayan glaciers have shown stages of advance and retreat since the last 20,000 years and hence the retreat of the glaciers could not be attributed to climate change. Raina said he had come to this conclusion through years of study of the Himalayan glaciers. 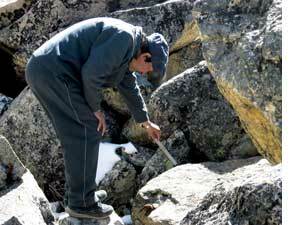 Tracing the age of lichens or lichenometry is the only method to trace the recession of glaciers, said Chaujar. Using this technique in a study of Uttarakhand's Dokriani Bamak glacier, that was presented in a conference in 2006 in Barcelona, Spain, Chaujar showed this glacier had been retreating similarly for the last 314 years. Raina claimed that lichenometry is not a reliable method. "It only proves the absence of a glacier from a site. It does not indicate its recession," he said. He also challenged the assumption that the rate of lichen growth is almost constant. Glaciers in the southern hemisphere show a similar trend. A study published in the Journal of the Royal Society of New Zealand in 2004 showed that the Franz Joseph glacier of New Zealand has been receding since 1750.